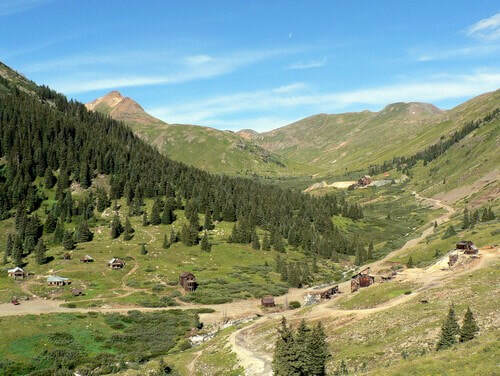 A fantastic loop trail through the heart of the San Juan Mountains outside Silverton. 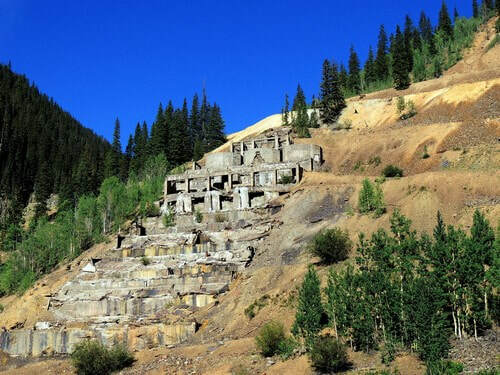 Historic mines and mills, Animas Forks ghost town, high passes, Lake Como and unparalleled scenery. Be sure to stop at the tourist information in Silverton to pick up information on the area. There is much more information available than the few highlights we will cover here. This major access road for the San Juans can be driven in either direction but will be described counterclockwise. 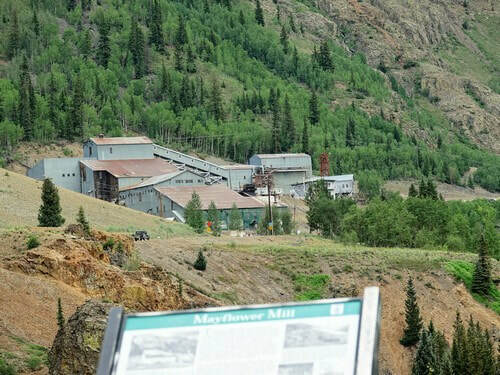 There is a pullout a short ways from town with signs about the Alpine Loop and the Mayflower Mill. This is well worth a stop. 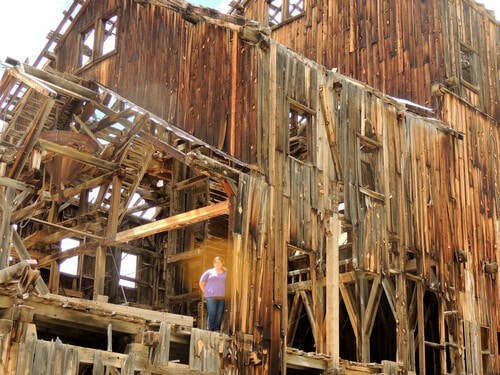 The mill is owned by the San Juan County Historical Society and self guided tours are offered in the summer. Tram lines cross the road just beyond the mill headed for the Mayflower Mine. The mine is described in Mayflower - Little Giant 2.0. 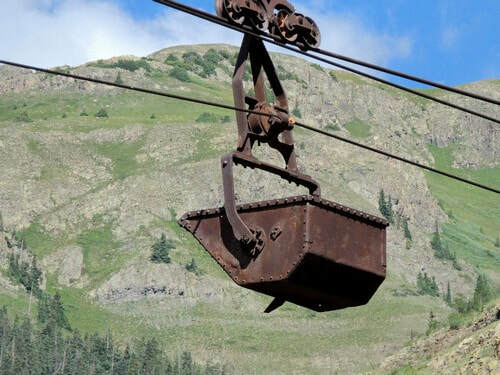 An ore bucket is suspended above the road. Cross the Animas River and come to a building with "Colorado Goldfields" on the side. This is Pride of the West Mill. There is an interesting mining story about the mill. Continue following the wide graded road up the Animas River to Eureka where you see the foundation of the Sunnyside Mill. This is described in Eureka Gulch 2.0. The road gets very rocky and bumpy after Eureka. Keep watch for a cabin near a waterfall on the other side of the river. 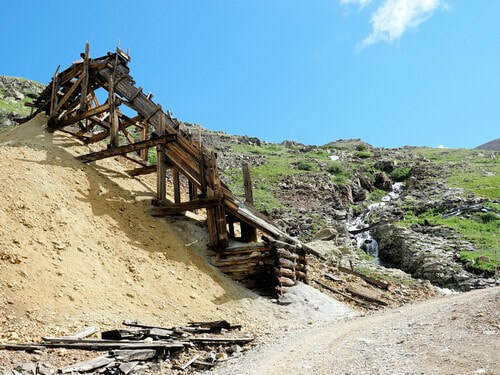 Continue to Animas Forks ghost town and tour all of the structures. 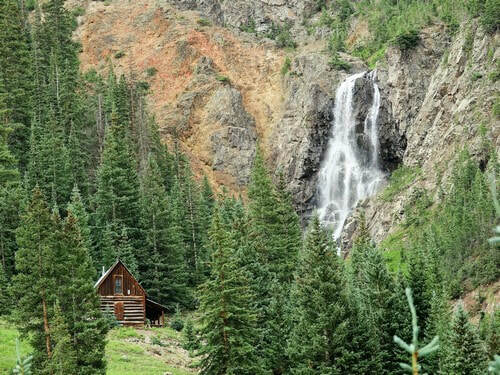 Frisco Mill is the first major attraction as you leave Animas Forks and head up California Gulch. 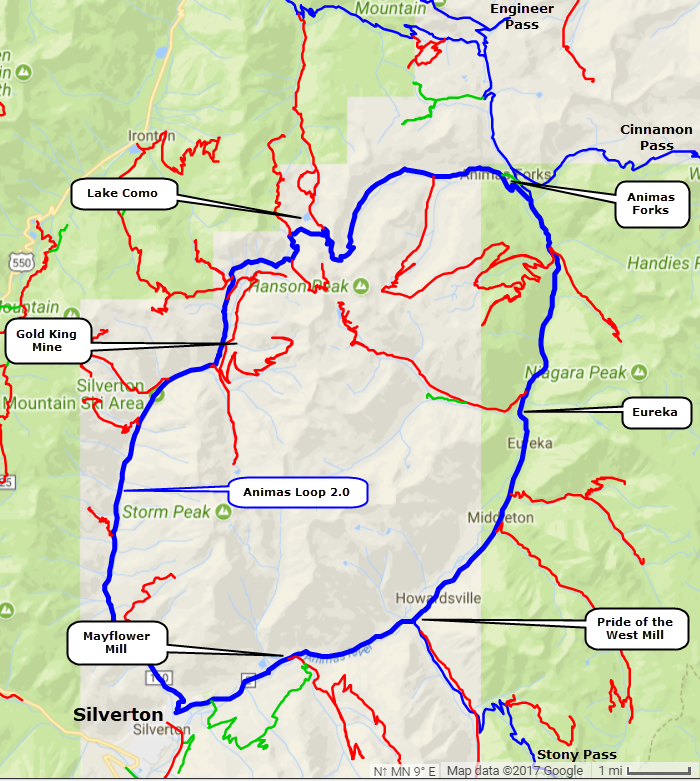 Both Animas Forks and Frisco Mill are described in Alpine Loop 2.5. Continue up California Gulch and go over 12,930' California Pass. Drop down the other side and see beautiful Lake Como. 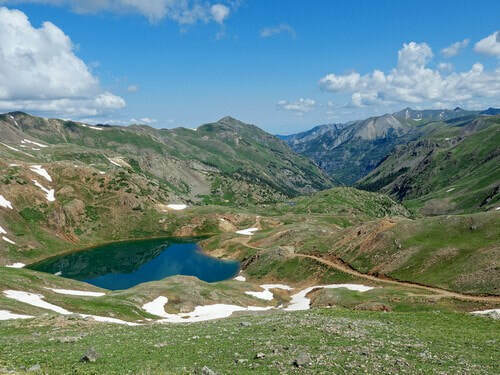 Climb up from Lake Como to 13, 238' Hurricane Pass then drop down into Cement Creek Basin. There is a nice ore chute on your way down. 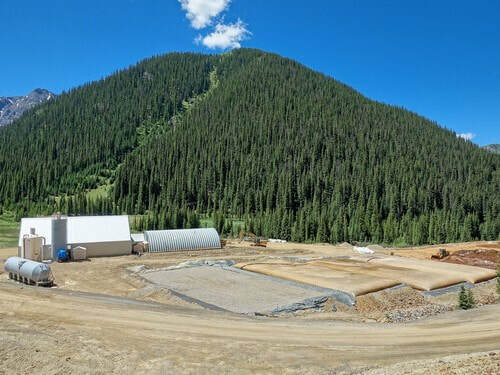 Mogul Mine can be seen in the bottom of Cement Creek Basin. The Red and Bonita Mine is farther down the creek. 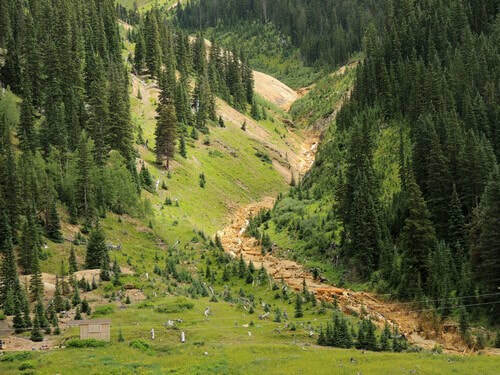 This mine is leaking 300 gallons per minute of toxic mine waste, and the EPA is looking at ways of stopping it. 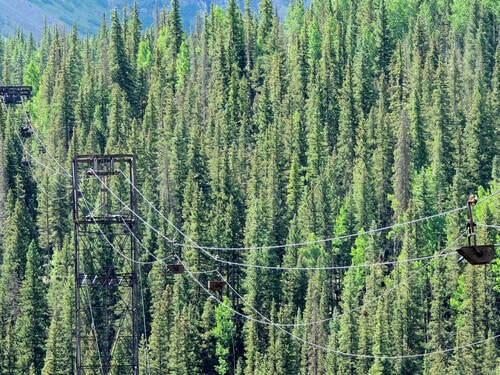 It will be difficult because the extensive history of mining has ​left behind the geologic equivalent of Swiss cheese in the mountains. 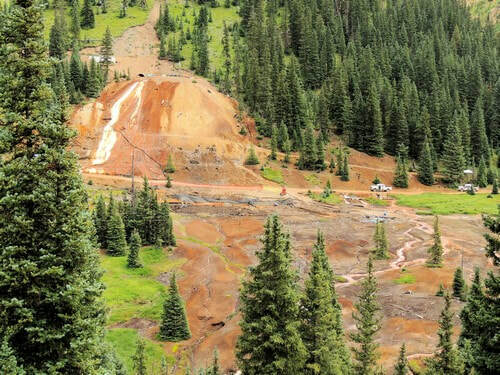 Let's hope they do better than they did with the Gold King Mine, less than a half mile from the Red and Bonita. 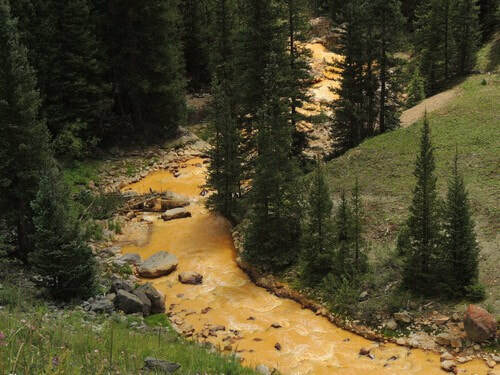 The Gold King Mine spill put 300 million gallons of acid mine water and heavy metals into the Animas River. ​Look downstream a few hundred yards and you will see a drainage on the other side of Cement Creek. 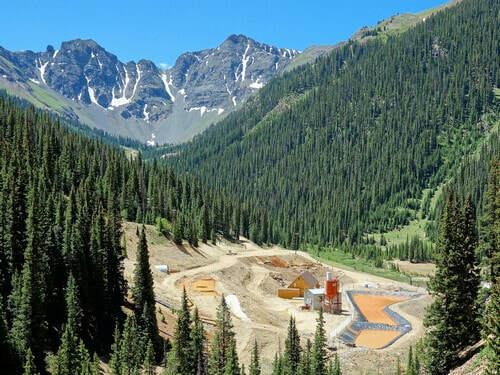 The Gold King Mine is up this drainage. The Animas River was yellow all the way to the Colorado River. 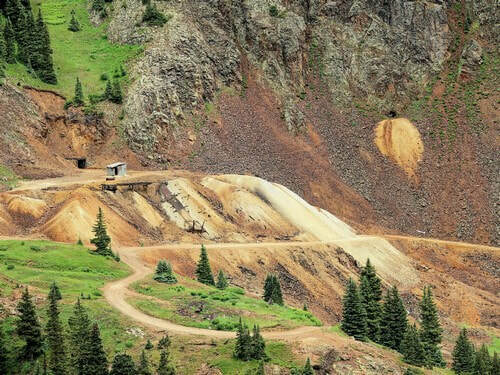 As of 2017 the Gold King Mine is draining 710 gallons per minute of mine waste. The EPA is piping it to a filtering plant and cleaning it before discharging it into Cement Creek.